Wholesale Pillows with Free Shipping! Wholesale Pillows in Bulk by the case with Free Shipping! 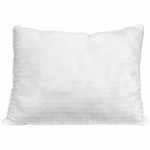 Palmetto Linen Distributors offers wholesale pillows in bulk quantities with free shipping on every order! Our down-alternative pillows range in quality from low-cost Gold Choice Hotel Pillows up to Luxury Gel Fiber Filled Hospitality Pillows. Enjoy the ClearFresh Eco-Smart pillows found in many luxurious hotels at wholesale prices! Eco-Smart linen products are made for those looking for green, environmentally friendly products. Eco-Smart is a polyester fiber that is created from 100% recycled plastic PET bottles. The fiber has been processed into a high quality fiberfill that enables it to be used in different formats for traditional polyester filled textile products. As a general rule, recycling 10 plastic bottles equals one pound of fiber. Filling one Eco-smart bed pillow saves 14 plastic bottles from being dumped into a landfill. The practical side of using Eco-Smart bed pillows is that they are truly washable! Washing and drying an Eco-Smart bed pillow reinvigorates the fiber fill making it as good as new. Please contact us if we can help in any way.